promptly moved their families to Deer Park. Among these were the popular "Uncle Bill" Hennen and James A. Annan. About the same time came G. W. L. Lohm and Fireman John Sluss. Michael J. Canty came along some years later. Truman H. Mosser, better known as "Buck," came to Deer Park about 1908 as a Fireman, married Nora Specht, a local girl, and was a resident for many years, later moving to Mountain Lake Park when the helper engines were transferred to that point. A number of Deer Park's young men became Firemen, serving an apprenticeship on the helpers. Among these were Harry Thrasher, Dan Hinebaugh, Jim Hardesty, Earl George, Mason Smith, Otto Droege, Charles A. Garrett and others. Of these only Messrs. Mosser, Droege, George and Garrett, all now Engineers, are still in service. John W. Jankey and George W. Riley began as Firemen in the 80's and were promoted in due time to Engineer. 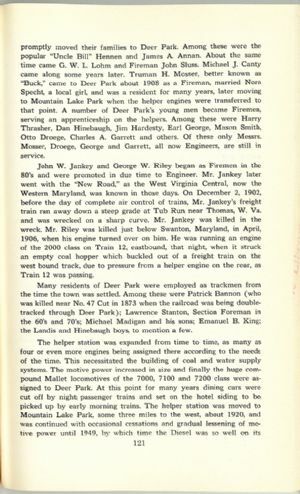 Mr. Jankey later went with the "New Road," as the West Virginia Central, now the Western Maryland, was known in those days. On December 2, 1902, before the day of complete air control of trains, Mr. Jankey's freight train ran away down a steep grade at Tub Run near Thomas, W. Va. and was wrecked on a sharp curve. Mr. Jankey was killed in the wreck. Mr. Riley was killed just below Swanton, Maryland, in April, 1906, when his engine turned over on him. He was running an engine of the 2000 class on Train 12, eastbound, that night, when it struck an empty coal hopper which buckled out of a freight train on the west bound track, due to pressure from a helper engine on the rear, as Train 12 was passing. Many residents of Deer Park were employed as trackmen from the time the town was settled. Among these were Patrick Bannon (who was killed near No. 47 Cut in 1873 when the railroad was being doubletracked through Deer Park); Lawrence Stanton, Section Foreman in the 60's and 70's; Michael Madigan and his sons; Emanuel B. King; the Landis and Hinebaugh boys, to mention a few.